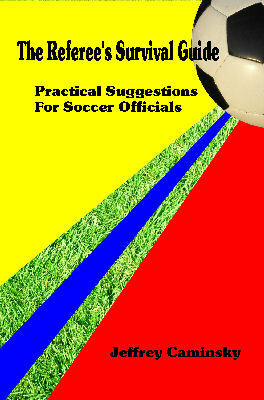 If you are a new official, this book is a must read!" Soccer cannot thrive without officials, but taking a basic referee course entitles you only to take the field with whistle in hand. It does not guarantee success on the field, and often will not even prepare you for what you will face once the game begins. Whether refereeing a youth game or adults, there is more to being a soccer referee than knowing the rules and blowing the whistle, and you must face your on-field challenges bravely and honestly. In the first chapter of the Referee's Survival Guide, we see some of the traits that make someone a good official. There is much for the officials to do before a soccer match can begin. Setting the proper tone for the match, organizing the paperwork, and preparing mentally for the challenges that lie ahead are only part of the referee's job, and one that few of the participants ever see. In addition, most accomplished referees have similar attitudes about the game and themeselves, that help achieve success on and off the field. With a little effort, even the beginning referee can begin to develop the kind of outlook that can help, once the whistle sounds to begin the game. In soccer, as in life, there is an endless array of personalities and temperaments, and part of a referee's training is preparing to deal with all of them. Knowing the various types of players can help, and many of those types are not only colorful---they can actually be quite amusing, as long as we manage to keep our sense of humor. Stanley Lover, author of Soccer Match Control and Soccer Laws Explained.